A couple in Carlow who each had several years of experience in the coffee trade decided to establish their own business, supplying commercial machines to restaurants, coffee houses, and convenience retail stores, and supplying office coffee machines to workplaces too. They were anxious to build a distinctive brand, that would reflect their own love of fine coffee, and to rank highly for relevant search terms. We said we’d brew up the perfect website for them. We first worked with our clients to establish the scale of the online market in Ireland for retail and office coffee machines, and to develop a digital marketing strategy. 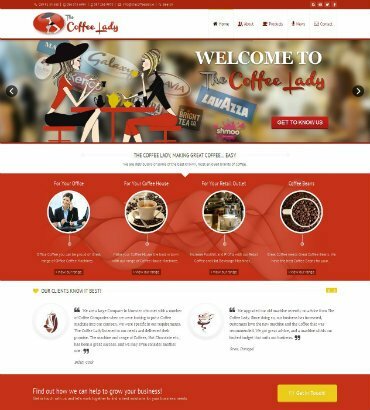 We agreed upon their branding – ‘The Coffee Lady’ – and designed a suitable logo suggesting elegance and sophistication. We also agreed upon their motto ‘We make great coffee easy’, and an overall structure for their website. A comprehensive copywriting service was the first step, as we composed product descriptions for almost twenty coffee machines and more than a dozen varieties of coffee beans, coffee capsules, and other associated products. This content and relevant imagery was then categorised appropriately in an easy-to-navigate website structure that allows the user to find exactly what they are looking for. An elegant overall theme and colour scheme, reflecting the new logo, was implemented, and we performed diligent on-page SEO work to achieve the rankings desired. The site is constantly evolving as new product descriptions and news posts are added.